TheRead Text File	component reads and outputs the contents of a file as plain text. To add it to a flow within the Flow Designer, go to the Toolbox	panel, expand the category Integration > File	and then, drag a Read Text File	component to the workspace. This example begins with the assumption that our file system contains a text file called Sample Text File	. The first step in our flow will be the Read Text File	component. In theFlow Designer	Quick Add window, go to Integrations > All Integrations > File	, select a Read Text File	component. Click Add	to add it to the workspace. 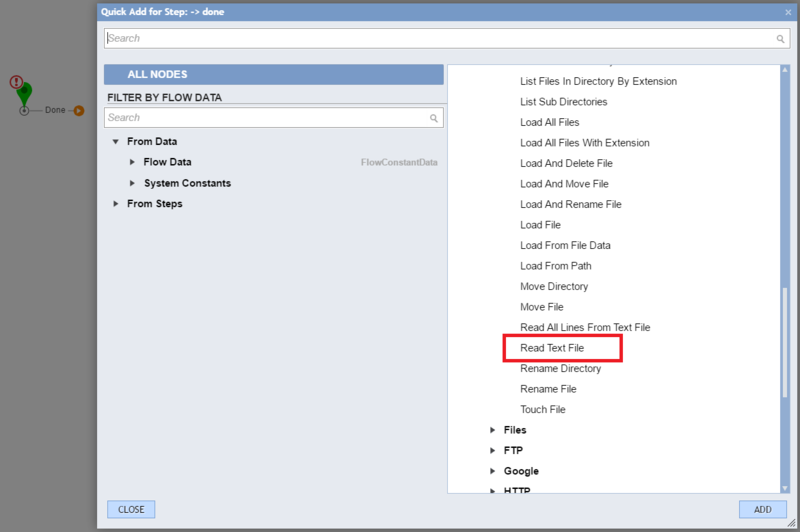 The next step in our flow will be the form we use to display our file contents -Display Sample Text File Form	- which is in theToolbox	panel, under the categoryForms [Interaction] > [Current Folder]	. Next, configure Read Text File	by selecting it and clicking the Edit Input Mappings	link on theActions Toolbar	. 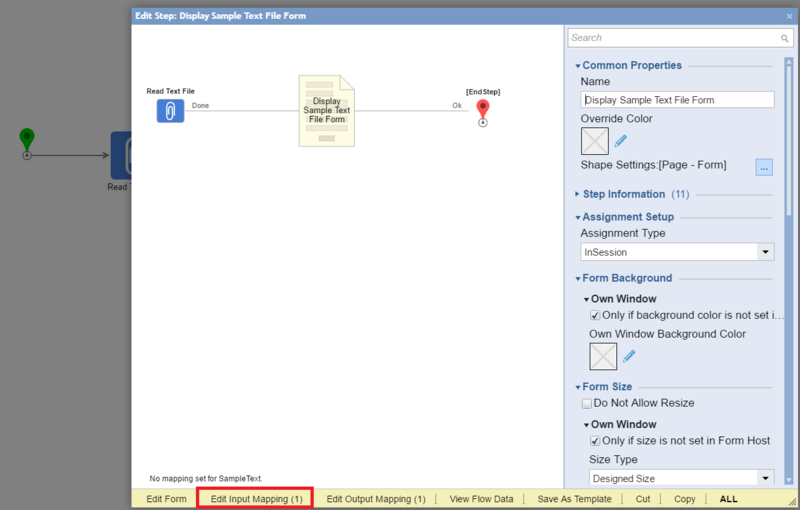 Our example flow requires thatRead Text File	should read the file C:\SampleTextFile.txt	, so give the input file Name	a mapping type of Constant	and a value of the path and file name. With that done, we can clickOK	to close the Mapping Editor . ConfigureDisplay Employee Status Report	by selecting it and clicking the Edit Input Mapping	link in the Actions Toolbar. 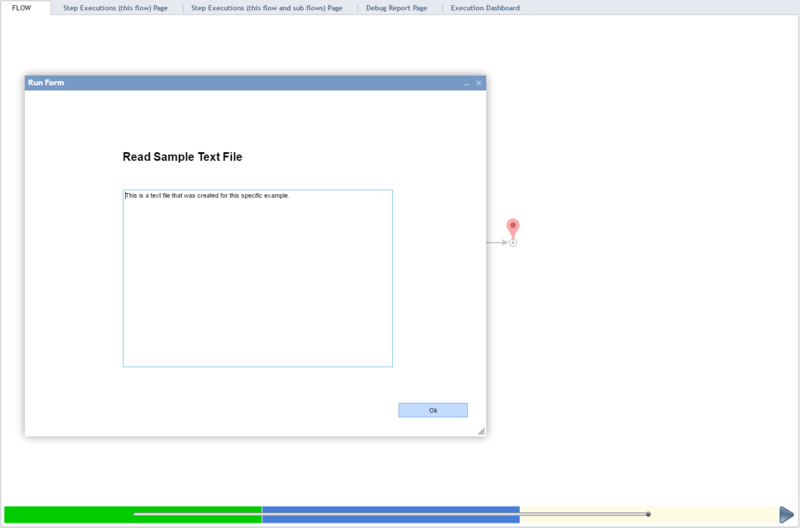 Our example flow requires thatDisplay Sample Text File Form	should display the file contents provided by Read Text File	step**. **	Therefore we will map the output ReadTextFile_Output	to our form&apos;s input FileData. Click OK	to close the Mapping Editor. Click the Debug Flow	link to test the flow. In the debugger, we&apos;re presented with a form with one field containing data from our text file.